There are some frustrating diseases that will attempt to attack our rose bushes when the circumstances are right for them to get going. It is important to recognize them early, as the quicker the treatment is started the quicker control is gained limiting the stress on the rose bush as well as the gardener! 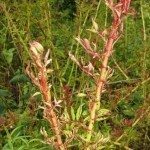 Here is a listing of the most common diseases to know about with our rose bushes in my Rocky Mountain Area as well as other areas across the Country. Following this common listing are a few other diseases that may need to be dealt with from time to time in some areas. Remember, a disease resistant rose bush is not a disease free rose bush; it is merely more resistant to disease. Black Spot Fungus (Diplocarpon rosae) – Black spot on roses can go by other names as well, such as leaf spot, leaf blotch and star sooty mold to name a few. This disease first shows itself on the upper leaf surfaces and some newly forming canes with small black spots upon the foliage and newer canes. As it gains strength, the black spots increase in size and will start to form yellow margins around the larger black spots. The entire leaf can turn yellow and then fall off. 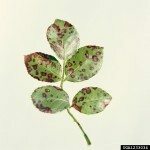 The black spot fungus, if left untreated, can totally defoliate a rose bush, causing a weakening of the overall rose bush, thus high stress on the plant. This particular disease is a worldwide problem for Rosarians and gardeners that grow roses. Even after treatment and control has been achieved, the black spots will not disappear from the foliage. The new foliage should be free of the black spots unless there is still a problem with it being active. Powdery Mildew (Sphaerotheca pannosa (Wallroth ex Fr.) Lév. var. rosae Woronichine) – Powdery mildew, or PM for short, is one of the most prevalent and serious diseases of roses. This fungal disease produces a white powder along the tops and bottoms of the leaves and along the stems. Left untreated, the rose bush will fail to perform well, the leaves will have a wrinkled appearance and eventually die and fall off. The first hints that powdery mildew may be getting started are small minutely raised blister looking areas on the leaf surfaces. Once this disease has taken hold enough to wrinkle the leaves, the wrinkled appearance will not go away even after treatment and the powdery mildew is dead and no longer active. Downy Mildew (Peronospora sparsa) – Downy mildew is a rapid and destructive fungal disease that appears on the leaves, stems and blooms of roses as dark purple, purplish-red, or brown irregular blotches. Yellow areas and dead tissue spots appear on the leaves as the disease gains control. Downy mildew is a very tough disease that can kill the rose bush if left untreated. Some treatments by themselves may be ineffective, thus using two or three fungicidal treatments 7 to 10 days apart may be required to gain control and stop this disease. Rose Canker or Cankers (Coniothyrium spp.) – Canker usually appears as brown, black or gray areas on a cane or stem of the rose bush. These areas can be caused by damage from the deep cold of winter or some other damage to the rose bush. This disease is easily spread to healthy canes on the same and other rose bushes by pruners not being cleaned after having pruned out the damage on infected canes. It is highly recommended that the pruners be wiped down with a disinfectant wipe or dipped into a jar of Clorox water and let air dry, prior to using the pruners for any further pruning after having pruned out a diseased area. Rust (Phragmidium spp.) – Rust first shows itself as small rust-colored spots on the undersides of leaves and eventually becoming visible on the upper sides as well as this fungal disease gains control. Rose Mosaic Virus – Actually a virus and not a fungal attack, it causes reduced vigor, distorted leaves, and reduced flowering. Roses with rose mosaic virus are best discarded from the garden or rose bed, and the only sure way to tell if a rose bush has this is to have it tested. Rose Rosette – This too is a virus that is transmitted by microscopic mites. This virus is contagious and is usually fatal to the rose bush. Symptoms of infection are peculiar or disproportionate growth, extreme thorniness on the new growth and canes, and witches brooms (a weedy splayed looking growth pattern of the foliage resembling a witch’s broom). Use of a miticide can help slow the spread of this virus in the garden or rose bed. Anthracnose (Sphaceloma rosarum) – This is a fungal infection with symptoms being dark red, brown, or purple spots on the upper sides of the leaves. The spots formed are usually small (about 1/8 inch) and circle shaped. The spots may develop a gray or white dry center that can fall out of the leaf, leaving a hole which can make a person think this was done by an insect of some kind. I highly recommend a preventative fungicide spraying program to avoid having problems with these fungal infections. There is not much that can be done about the viruses other than removing the infected rose bush(es) as soon as it has been verified that they are infected with the virus. To my way of thinking, there is no need to chance infecting other rose bushes trying to save the one or two with a viral infection. My program consists of spraying all the rose bushes as soon as the first leaf buds of spring start to appear. Spray all the rose bushes again in 10 days with the same fungicide. After those initial applications, follow the directions on the label of the fungicide being used for further prevention use. The labels on some of the fungicides will have special instructions for using the product at a Cure Rate, which is used for battling the fungus once it has gotten a good hold on the rose bush concerned.